Are you using GW paints with the air gun or Vallajeo? If you were thinking of getting a Stormlord variant I would advise using one of the Baneblades as a counts as first as I haven't found 1 that I prefer to a Baneblade. I use Reaper Master Series almost exclusively. I've put GW paint through the airbrush also-- just requires more thinning. I mix whatever I'm putting through the airbrush with Createx acrylic thinner, which so far has worked pretty well. I'm still learning the ropes in general with the airbrush-- I'm hoping to learn how to do more detail with it soon-- at the moment, I can do basic gradients, weathering, and obviously undercoating things quickly, but that's about the extent of my skills with it. I'd like to figure out how to do extremely fine lines so I can use it on larger infantry models, too. Nice work going on here!! I finally finished the second Contemptor. I ended up using the extra claws from the Forgefiend/Maulerfiend kit for the fingers on this one's close combat weapon, just for some variety. Here's both of the Contemptors. I still need to get a third to finish off the Talon, but I think for the time being, I'm going to focus on infantry and get some more Tactical Squads up and running. 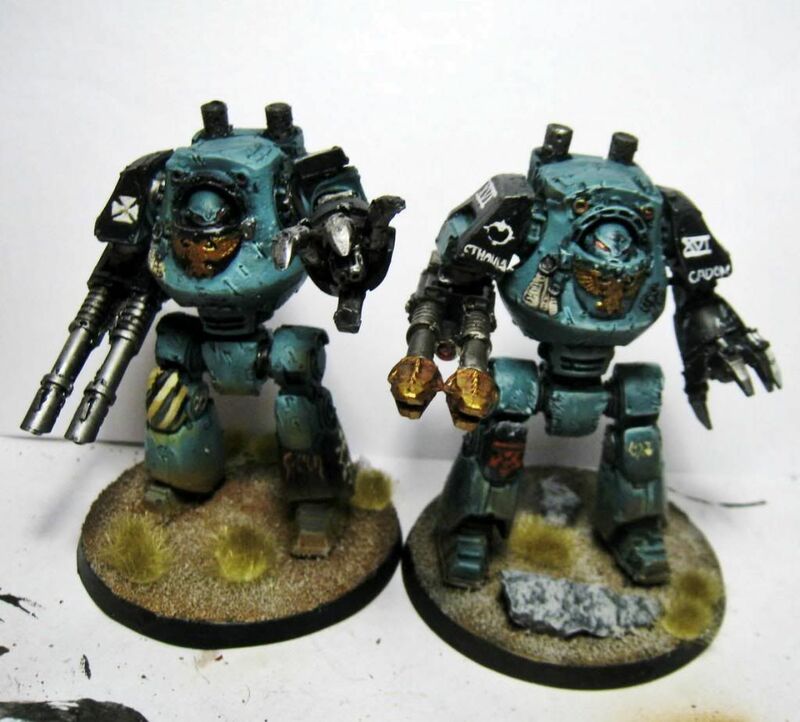 Great looking Contemptors, though I think the battle damage to the one on the left is a bit too... uniform. All of the scratches seem to be at the same angle, which seems odd for erratic damage taken throughout a fight. Maybe it was the salvo from one particular weapon? Then it would make sense for a single volley to cause damage in the same direction, as the projectiles (or lazor beams if they're being fancy) have all come from the same source (unless it's Orky). I can most definitely agree with the "badass" sentiment, however. Well, it may not be a third Contemptor, but I've had a regular Legion Dreadnought on the desk for a couple weeks and today seemed like a good day to finish it. I keep telling myself, "Horus, you've gotta start on those sixty-some-odd Marines in Mk. IV armor. Maybe paint up the Tactical Support Squad that's got ten plasma guns, and play with light sourcing." But no, I keep finishing the shiny large models first-- it's the exact opposite problem I usually have. When I paint an army, generally, the tanks and dreadnoughts and whatnot are the last thing I touch because I've always favored painting infantry to vehicles. But with the addition of the airbrush to my arsenal, I've found I actually don't hate painting big models anymore. One of the things I've been working on lately is getting a copy of Dark Vengeance painted up for the store so we'll have a demo copy. I'm not going for particularly high quality or anything-- if anything, you want the results to seem achievable to the average passer-by-- that was one of the great flaws with Confrontation, if any of you recall that game-- people were turned off by how incredibly the miniatures on the boxes were painted and felt like they could never come close to the examples. So I'm not doing any blending or anything like that on the models for the store's Dark Vengeance-- just basic layering. 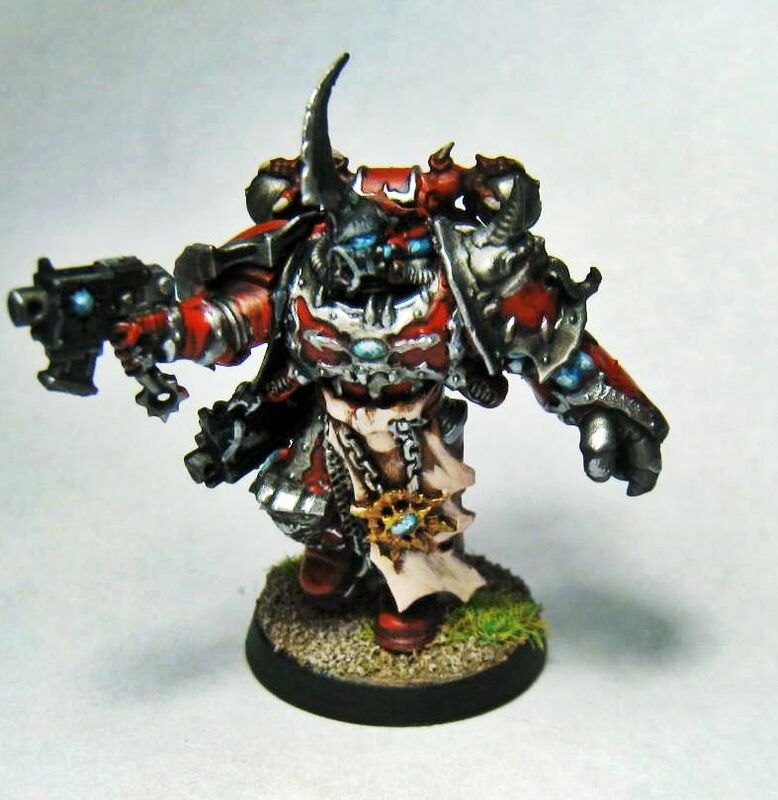 I decided to do the Chaos Space Marines as Word Bearers...figured they'd look similar to what's on the back of the box, but be actual Traitor Legionnaires instead of some random renegades. 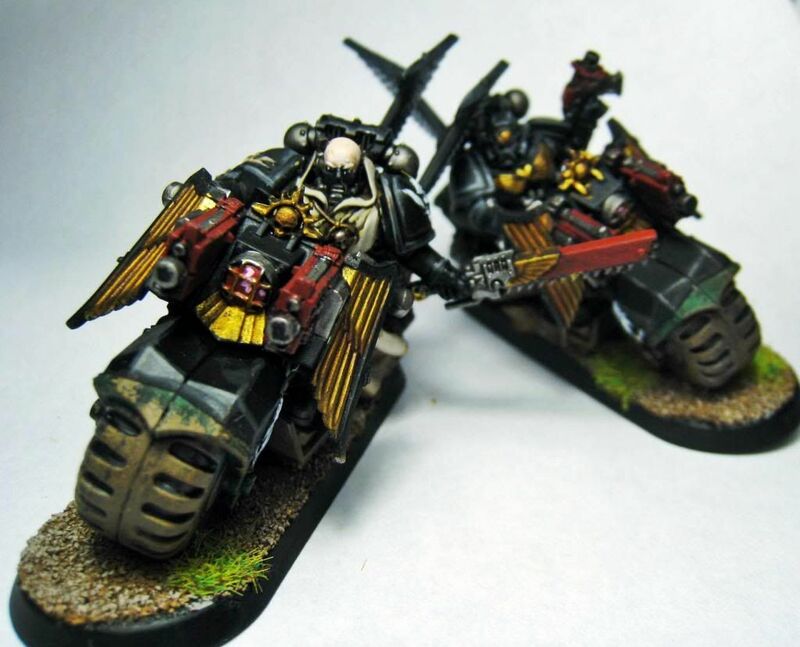 At the moment, I've finished one Deathwing Terminator, the Ravenwing Bike Squadron, and one of the Chosen. I've also finished most of the Librarian. Anyway, here are a couple pictures... there'll be more in a bit. Last edited by The Son of Horus; 01-03-13 at 12:10 AM. 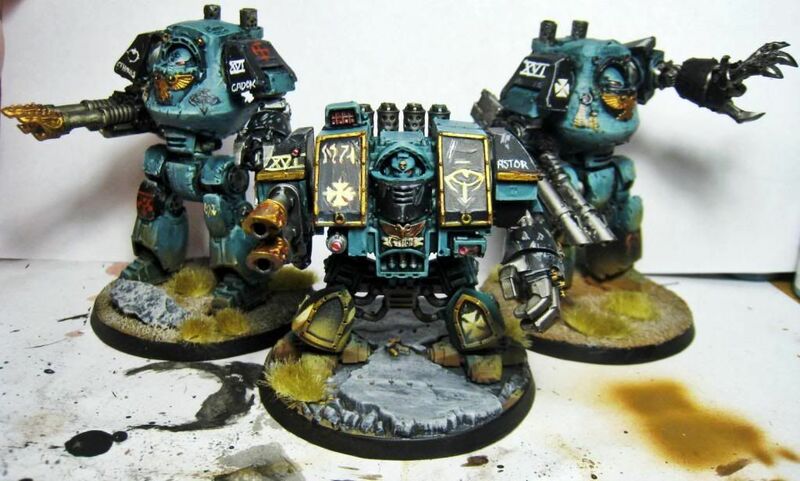 I think the blue on the contemptor dreads looks really good that's what stands out the most to me on this log it has real depth. I must say, your SoH have grown on me from awesome to simply amazing! Glad I could help even a little! The one stop shop for all REAL Forge World Bits! Discount Code: eve20 , for 20% off all orders for the New Years!